I have finished the circle around the kantha booti and the petals. Like I said earlier the flowers and kantha booti are mostly asymmetrical in kantha embroidery.I chose to keep it that way but you can also make it symmetrical if you want. So far I was stitching with only black color and I thought it would be better to throw in some colors. I have stitched the outline of the circle with whipped running stitch aka paichano using 2 strands of Anchor yellow floss shd # 289. Also I have covered the area between kantha booti and circle with 2 rounds of kantha stitches using the same yellow floss. I have filled the petals with 2 colors but you could also do this with one color.It looks like satin stitch but it's not.It is kantha stitch filling.I have used 2 strands of purple shd # 112 and variegated pink shd# 1205. 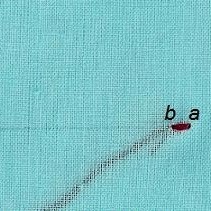 Step 1: Bring the needle and thread up at 'a' and go down at 'b'. Come up near 'b' as shown. Step 2: Go down near 'a' and come up as shown. Repeat these steps until the petal is covered. This is how the back side looks.I haven't finished the threads at the back yet,sorry. To begin work a row of running stitch. 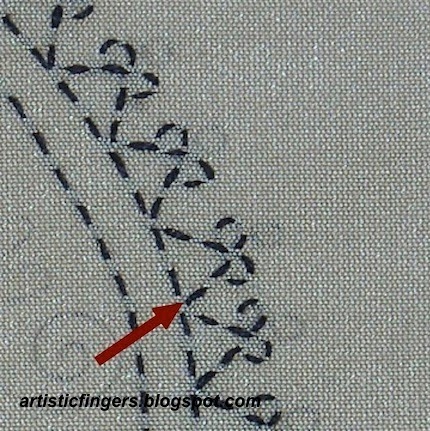 Step 1 : Bring the needle and thread up near the first stitch as shown. Step 2 : Without piercing the fabric pass the needle and thread under the stitch and pull. Repeat step 2 until all the stitches are whipped. Go down near the last stitch and fasten off. I had managed to work a little bit on some of the projects, not much progress but even a little progress is better than nothing,right? I had to sew a dozen of these small bibs for the dolls.I couldn't complete the embroidery part when my nieces were here so I worked on that earlier this week and mailed it to them.. I started working on this blue/yellow needlepoint project for a friend.When there were only a few stitches left I ran out of the dark yellow and blue threads :( . Since my nearest LNS is 50+ kms away from my place this one will go to my UFO basket for now. I worked on the design of this shisha piece few months back,started the actual stitching this week..so far am happy the way it's turned out..still lots more to stitch. Apart from these I did some sketching,some experiments with inktense blocks worked but a few turned out to be a total disaster..
SAL Kantha - spirals,scrolls and kantha booti. I have finished the spirals and scrolls with kantha stitch using 2 strands of black stranded cotton thread. Then I have filled the center motif with a stitch called 'kantha booti' using 2 strands of black floss. Booti means motif. Please don't fill the motif with very closely placed stitches like satin stitch filling. Did you notice that this kantha booti in our pattern is not symmetrical ?Asymmetrical are part of many kantha quilts. I thought some of you would like to have a tutorial for 'kantha booti' so here it is..
Kantha booti is always worked from the outer line towards the center. 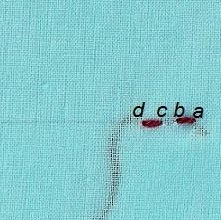 Step 2 : Bring the needle and thread up near 'a', go down near 'b', come up near 'c' and continue working in circle until the entire motif is filled. This is how the completed motif should look. Hint: In case if all the petals but one is filled then you could add a couple of stitches only in that petal to complete this motif. I will be back next wednesday with an update. If you have thousands of nieces like me... ( just kidding :) but I do have a huge bunch of them ) then you'll understand my situation for sure. The square pattern is from crochet today magazine. More squares..to be made into a purse later. Flowers to be glued to hairbands,clips,shoes and on any surface the girls would like to.. Despite all the work I just love the kids a lot and we had a great time.I would like to share an interesting and funny conversation I had with my neighbor's daughter.. I had invited my new neighbor's kids for a fun art session with the girls.We were drawing and coloring a house,garden and a family. Smart 4 year old kid : Yes,I do have a brother. Me: Shall we draw him? How old is he? Smart kid: He is zero years old. Smart kid: I'm learning numbers at school.I know zero comes before one.My brother has not yet celebrated his first b'day and that's why I'm saying he is zero years old. Happy stitching! Have a great and fun week end! I have finished the outer eye-shaped border with kantha stitches using 2 strands of black stranded cotton thread. The next step is to complete the outer triangle border and hook things at the tip of the triangle with kantha stitches using 2 strands of black thread.For this as I said earlier we need to plan a stitch route. I started from one end of triangle which is indicated by an arrow in the above image,took a couple of stitches to reach the tip of the triangle, finished the hook thing on both sides ,then worked a couple of stitches on the other slanting side of the triangle and repeated the same plan to complete the entire border. You don't have to follow the same route.Please go ahead and choose one which you think the best route.The only criteria here is you should be able to complete the border without leaving a longer passing thread. I'd like to share and emphasize a couple of things before taking off. 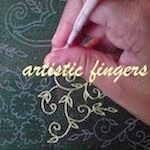 I'm writing this because some of you have e-mailed me saying that you consider yourself as a beginner and hope these tips helps.These tips are for beginners only so if you are an advanced stitcher then please skip this. - Do not use cheap plastic hoops.Please buy a good quality wooden hoop. - While fixing the fabric in your hoop make sure that the fabric is along the grain which means the fabric threads should be straight and not diagonal in your hoop and it should be stretched drum tight. - Do not hold the fabric in your hand and try to fix it in the hoop.Instead place the inner ring on your working table or any flat surface,keep your fabric on top of it and then push the outer ring on top of that.Tighten your screw and pull evenly on all sides of the fabric by rotating your hoop until you get the tension right. 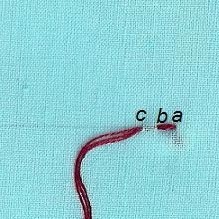 - The floss/stranded cotton threads has 6 strands.Mostly we need only 2 strands of thread for kantha embroidery.You have to separate the strands and join them again to avoid twists while stitching. 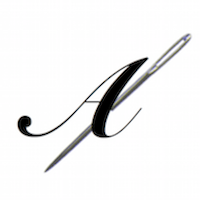 - I prefer to stitch with 16'' length thread.You could also measure the thread from your finger tips to elbow and cut it off which will be 16'' length approximately. - To avoid puckering of fabric do not pull the stitches tightly. Come on in…. Let's start stitching. I have stitched the inner line of the eye-shape with 'running stitch' which called as 'kantha stitch' in kantha embroidery using 2 strands of black Anchor stranded cotton thread. The stitch length and the distance between two kantha stitches should be less than ¼'' . 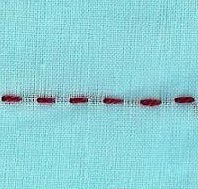 Stitch route is very important in any surface embroidery especially in kantha embroidery .I started to stitch at one tip of the eye-shape, worked around and ended it close to the starting point. If you choose to work the kantha stitch by stabbing method ie going down and coming out of the fabric by keeping the needle at 90 degrees then it's fine but if you choose to do this by sewing method then my suggestion would be not to pick more than 2 stitches at a time. If you have any questions please feel free to leave a comment here. P.S. Don't forget to come back next wednesday for the kantha update. 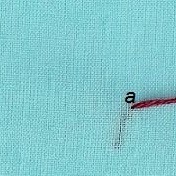 1.Bring the needle and thread up at 'a'. I have started stitching the leaf behind the petals.The tip portion is complete but the base needs some more stitches with medium, dark and very dark green shades. This is an RSN pattern stitched by Debra Barrett.